History: George has an outstanding musical ability as well as a huge wealth of engineering experience. His fantastic ear and perfect pitch have their roots in a musical upbringing. Both parents sang opera - his father a well-known principal at Sadlers Wells and ENO. George studied 'cello and piano at the Royal College of Music. He also plays guitar and bass, and has a large collection of keyboards. At home he has an analogue 24 track studio crammed full of vintage goodies, along with a ProTools setup. 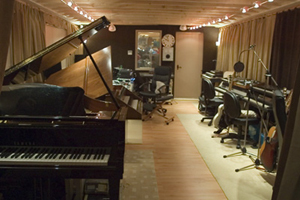 After the musical training, George received an engineering training from Jerry Boys (ex-Abbey Road) and many world-class producers and engineers who passed through Livingston Studios. He quickly achieved chart success with Coldcut, engineering the huge Number 1 gold smash 'The Only Way Is Up' by Yazz at the age of 21. Other hits quickly followed with James Brown, Lisa Stansfield and The Soup Dragons, whose massive worldwide Top 5 hit 'I'm Free' and the No.1 album 'The Lovegod' George produced and engineered. He has engineered for luminary producers such as John Leckie, Brendan Lynch and Mike Hedges. Albums by Five Thirty and Airhead followed. In recent years George has worked with Teenage Fanclub, Primal Scream, and has engineered both Bernard Butler's solo albums. In addition, remixes have been engineered for Blur, Gabrielle and New Radicals. "I love capturing and mixing live band performances in the studio, and equally I love getting a programmed track really kicking… I like to work fast!" says George. George has a 24 track analogue studio at home for pre-production and small projects of his own. At home he records with ProTools and also programs with Digital Performer, Cubase, Reason and Logic Audio. However, he is at heart a collector of toys: "I have loads of old junk - FX Pedals, electric pianos, percussion etc. I love a carboot sale, and will always bring home some vintage vinyl. I still practise the 'cello and piano when I can, and love a good jam session on guitar, bass or keyboards with a couple of friends." Member of Music Producers Guild, George writes, regularly reviewing equipment and doing interviews for Resolution, Studio Sound and The Mix. He writes manuals and also conducts video interviews for Record Production . George has also designed and maintained his own web site (see link in contacts) since 1995. In recent years Shilling has had enormous success with artistes such as Bernard Butler, whose 'Stay' reached Number 12 in the UK, Teenage Fanclub - George recorded and mixed 'Ain't That Enough', their highest charting single and Primal Scream, whose 'Kowalski' reached Number 8 after George mixed it! George has also engineered a number of remixes such as Gabrielle's 'Rise', New Radicals' 'Mother' and The Corrs' 'Lifting Me', and glance at the Credit List to see the names of Blur and Texas, for example. Recently he has worked with Nicole Appleton, new project Exile Inside, French recording legend Johnny Hallyday, and the Opera Babes at Number 1 in Classical Chart and No.24 in the pop charts. "I've recently been working with Latvian rockers Detlef, London band The Medicine, and co-wrote a song on a French top 3 (Universal Music) album by Nolwenn Leroy which has sold more than 250,000 in France alone since December!"